Why not get your holiday shopping done early at some of the wonderful seasonal bazaars that showcase artisans and their handicrafts, with most bazaars donating proceeds to good causes. 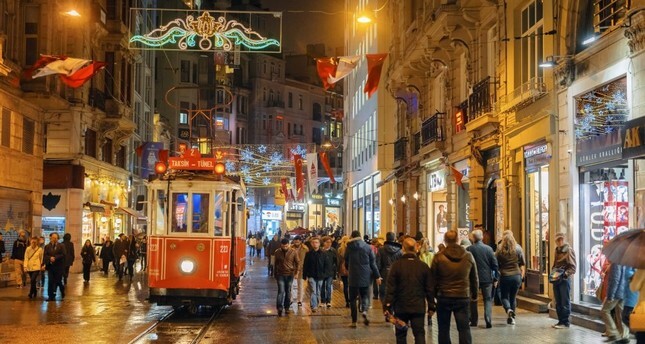 The French Institute of Turkey, which is located near Taksim Square on İstiklal Avenue, will be hosting a "Marchè de Noël" in other words a noel market, in its courtyard on Saturday, Dec. 1 from 10 a.m. to 6 p.m. Organized by the Istanbul Accueil, the city's Francophone association, there will be stands where you can purchase handmade holiday gifts as well as a full program of entertaining events for the kids. Amongst these include the showing of four short films for children, a puppet show, workshops such as singing Christmas carols and a Christmas cake contest. Every year, the private German high school, the Alman Lisesi, hosts a charity Christmas fair in conjunction with the German Consulate. This year will mark the 56th edition of this tradition, which will take place on Saturday, Dec. 1 from 10:30 a.m. to 4:30 p.m. in Şişhane. The Şişli Sports Club will be organizing their annual "New Year's Boutique" which takes place this year on Saturday, Dec. 1 from 10 a.m. to 8 p.m. at the Ramada Plaza Istanbul in Pangaltı. Held in conjunction with Eleos Restaurant, there will be jewelry, accessories, clothing stands along with lots of stands with a variety of gift choices, as well as yummy snacks. The International Women of Istanbul will be hosting their annual "Winter Festival" on Sunday, Dec. 2 from 10 a.m. to 5 p.m. at the Marriott Hotel Şişli. This member-based organization of the city's foreign women holds two big charity fundraisers a year with their Winter Festival being one of them. A great opportunity to shop for holiday gifts while checking out this excellent organization and mingling with the expat crowd, there will be stands selling international cuisine, handmade crafts, books, clothing and souvenirs. Tickets are TL 10 ($1.90) and will be available at the door and admission is free for children 12 and under. Circolo Roma, the Italian Cultural Center housed in the Casa d'Italia in Tepebaşı will be hosting their annual "Portobello Christmas Bazaar" on Wednesday Dec. 5 from 10:30 a.m. to 5 p.m. Whether you go to find gifts or just to gorge on scrumptious Italian food, this is a great opportunity to stock up on Italian products such as parmesan, panettone, sauces, pandoro, pastas, homemade jams and lots of homemade treats. There will also be the opportunity to dine on traditional dishes and espresso at their Ristorante Italia guilt-free as all proceeds will be donated to charities. On Saturday, Dec. 8, the Istanbul edition of Caritas, which is an international organization to assist the disadvantaged and impoverished, will be hosting a holiday market where refugee women will be able to sell their handmade crafts. There will be food and music from different cultures and a raffle at the end of the day. The event will take place between 10 a.m. and 7:30 p.m. at the Church of St. Mary Draperis located in the Tom Tom neighborhood of Beyoğlu. Ash Istanbul is the catering center for the Armenian restaurant Jash, which has locations in Cihangir and Kınalıada, and is popular with the expat crowd. Ash Istanbul will be hosting a "Noel Panayırı," in other words, a holiday fair with dynamic and creative designers setting up stands that will be taking place on Sat. Dec. 8 from 10:30 a.m. to 6 p.m. at their location in Pangaltı. One of the most highly anticipated holiday markets will be held by Handmade Istanbul, a collective of foreign and local Istanbul residents who produce handcrafts. The annual "Handmade Istanbul Holiday Market" will take place on Sunday, Dec. 9 from 11 a.m. to 6 p.m. at the Helena Chapel in Tepebaşı. Entrance is free and proceeds from the market will go to assist the St. George Hostel for U.N. registered refugees. The Little Sisters of the Poor will be holding a "Xmas Bazaar" on Saturday, Dec, 15 from 10 a.m. to 4 p.m. Held annually as a charity event by the Little Sisters of the Poor in Bomonti to maintain their elderly home, there will be handcrafts, gifts as well as cakes and cookies and food from all over the world. The English language theater company Speech Bubbles will be staging their traditional English pantomime on Dec. 7 and 9 at Arti Sahne in Torun Center in Mecidiyeköy. Every year, this multicultural theatrical troupe that also doubles as a performing arts school, puts on a holiday pantomime and this year's production will be Snow White and the Seven Dwarves. There will be a total of three performances over the weekend with the first taking place on Friday, Dec. 7 at 7 p.m. followed by two matinee performances on Sunday, Dec. 9 at 12 p.m. and at 4 p.m. Tickets can purchased online from speechbubbes.org or at the door and are TL 40 for adults and TL 35 for children. All proceeds from the show will be going to Mor Çatı, a charity dedicated to victims of domestic abuse.